Business, civic and legislative leaders gathered in Sacramento for the 93rd annual Sacramento Host Breakfast featuring remarks from CalChamber Board Chair Terry MacRae and Governor Edmund G. Brown Jr. 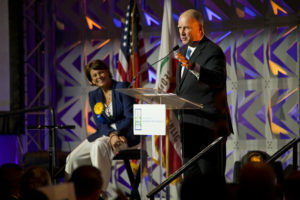 The annual breakfast was attended by more than 1,400 guests from throughout California. The Sacramento Host Breakfast offers decision-making leaders in California finance, government, education, agriculture, military and industry the opportunity to exchange views, establish and renew friendships, and create statewide atmospheres of good will and understanding, all at a common table. Among his comments, Governor Brown highlighted California’s economic growth and the need to continue persevering as the state meets new challenges. Terry MacRae discussed the importance of California tourism industry to the state’s economy as well as the challenges and rewards of growing a business in the state. CalChamber released a video highlighting the Governor’s record which shows how experience and a good sense of history can serve California well. Besides spearheading efforts to restore balance to the state budget, set up a rainy day fund and improve California’s schools, he has been a strong proponent of investing for the long term to put the state’s water, energy and road systems in better shape to handle the demands of a growing California. The CalChamber also released a video highlighting MacRae’s role on the CalChamber Board and how businesses in California are the job creators, wealth makers and the innovators who provide Californians with quality jobs. A group of students from the Oakland School for the Arts (OSA) came to the Host Breakfast to showcase the power of and passion for the arts education at this public charter school. Each year, students from OSA are accepted to enroll in top academic and artistic programs around the world. They bring with them a heightened sense of purpose and accomplishment that provides them with a foundation for success. A sold out crowd of 1,300 guests listens to Governor Brown speak. Governor Brown addresses the crowd for the final time while Host Committee Chair, Donna Lucas, looks on. 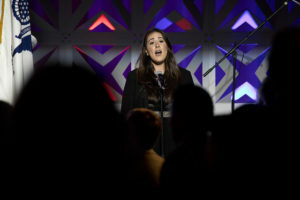 Angelica Whaley sings the National Anthem.